Delmar Washington, 60, spends around an hour each morning preparing paperwork and arranging flight schedules before departing on his first flight. Inside Delmar Washington’s office, a map of the Yukon spans an entire wall. A blanket of papers covers a wooden desk. The main office chair sits empty. Of course, a helicopter pilot’s office isn’t really where he works. Washington stops by his office to do paperwork between flights, but he’s usually in the pilot seat of one of his helicopters. Washington maps out every trip before he heads out. Of the six helicopter companies based in Whitehorse, Washington owns and operates two of them: Capital Helicopters (1995) Inc. and the Great Northern Heli Sports. 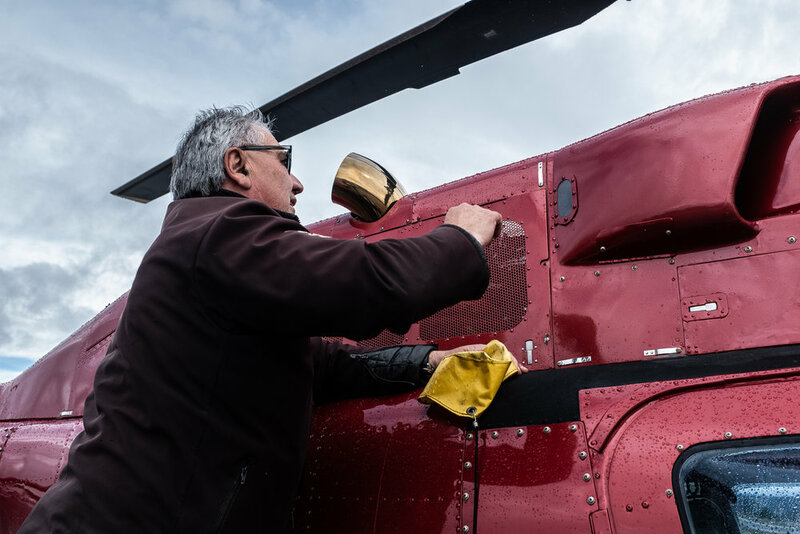 As a member of Champagne and Aishihik First Nations (CAFN), his businesses are the only helicopter companies to be certified Aboriginal businesses in Yukon’s capital. Washington cleans and inspects his helicopters before every flight. He says the process can take between 20 to 40 minutes, depending on the flight schedule of that day. He eventually got his first drum kit and continued to play as a teen in Whitehorse. He played in local bands and performed at community events until he moved to Vancouver in the 1980s with a rock trio, touring around B.C. and Alberta for years. In his early 20s, he went to Los Angeles to study percussion at the Musicians Institute of Technology. By the time Washington was in his 30s, after years spent on the road, he decided he wanted to settle down and save some money, so he returned home to Whitehorse. Washington says he drove transportation trucks to pay the bills and saved enough money to place a downpayment to buy one of his own. “I had some cash saved up and I was seriously thinking about doing it, but then I decided it wouldn’t be what I wanted to do,” he says. Washington takes a tour of his helicopter, ensuring all parts are secured and the machine is ready to go. After getting his helicopter piloting licence, Washington worked for Capital Helicopters, eventually becoming their chief pilot. In 1995, the opportunity came for him to reform the business and take over, but he says the banks wouldn’t loan him the money to do that. At the time, he says, the downpayment for a helicopter would have been around $25,000. Washington says he kept the name Capital Helicopters when he purchased it from the previous owner so recurring customers would be familiar with his services. Capital Helicopters (1995) Inc. now has four machines on the airport tarmac: two purchased and two leased. Washington usually starts his day well before 8 a.m. But in the 23 years he’s been in business, no two days are the same. “You have to be light on your feet,” says Washington. 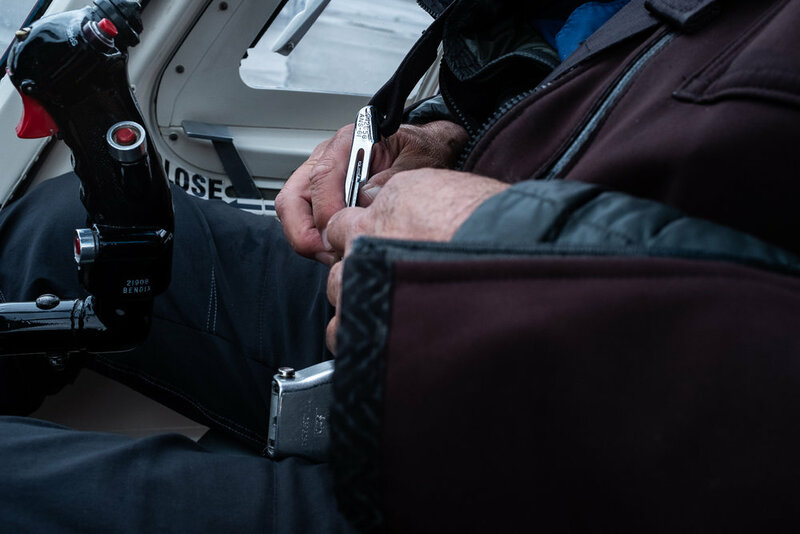 “We would be sitting here and suddenly a [medical evacuation] comes and you have to juggle other trips and this too,” he says, pointing to a stack of paperwork on his desk. Washington says when he was first starting out, finances were always an afterthought. He got help from däna Näye Ventures, a Yukon-based, First Nation-controlled institution that provides business development and financial services. Washington reflects the entrepreneurial spirit that däna Näye Ventures is trying to foster. For Meyer, encouraging entrepreneurs to start their businesses in the North is crucial to a sustainable, diversified economy. Whether it’s helping an artist form a business plan or consulting a multimillion-dollar corporation, Meyer says he believes there aren’t the same career barriers for entrepreneurs as there are for other jobs. Washington credits the help he got from däna Näye Ventures for his long-term success. 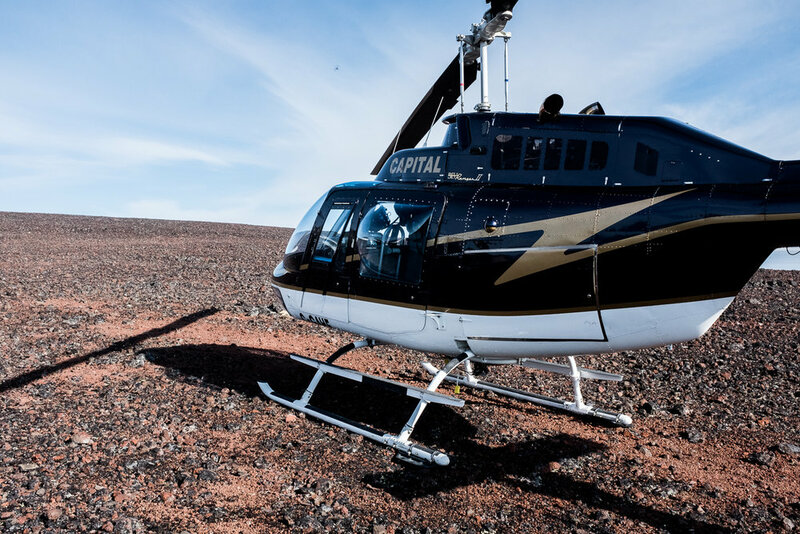 During the summer months, Capital Helicopters/Great Northern Heli Sports employs eight people. Washington buckles up before a water surveying flight. Washington says a helicopter is just another piece of machinery that everyone can learn to use with the proper training. The sound of the helicopter's rotors are so loud that Washington wear a second pair of ear plugs in addition to the headset to protect his hearing. 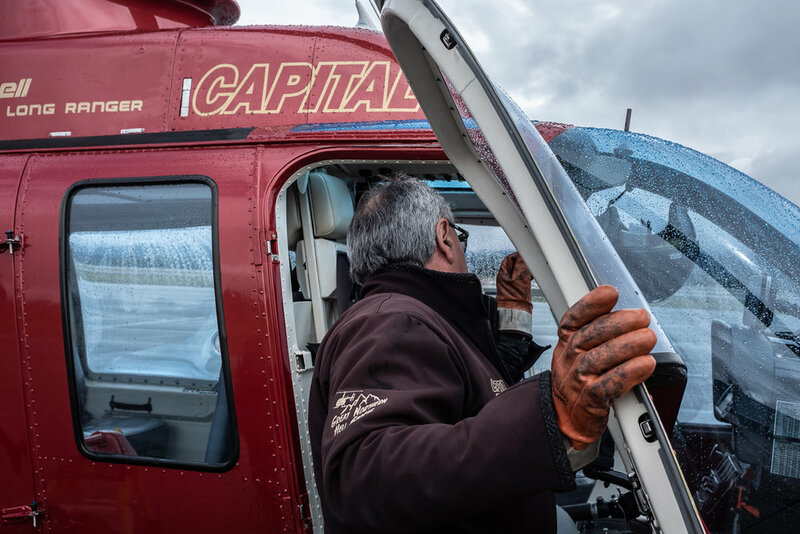 Washington says Capital Helicopters is busy, due to a steady demand for medical evacuations, search and rescues, big game surveys and captures, forestry and water surveys, and just about anything else that happens in the air. One of the memorable calls he received was for the transportation of Kwäday Dän Ts’ìnchi, “the man from the ice,” in 1999. Kwäday Dän Ts’ìnchi was found by a group of hunters in the Tatshenshini-Alsek Park in British Columbia. Some people wanted the 300-year-old body to be left where it was found, while others wanted to bring it into the lab to study. The Bell 206B Jet Ranger is a turbine engine helicopter capable of carrying four passengers. View on top of a ice patch near Alligator Lake, YT. As a member of CAFN, Washington says being involved with the project was something to remember, both for being part of the team to recover the body but also because he met “talented” professionals in the sciences who adapted protocols to respect the wishes of First Nations peoples. Washington enjoys the view and a cup of coffee while stopped on a glacier patch. Washington says he likes to contribute to his community through his business, often giving rides to elders for free. He has also been providing transportation for a heli-skiing camp for Indigenous youth. He says camps like this help more Indigenous youth think of helicopter piloting as a potential career choice. “I think youth, in general, are a good investment,” says Washington. Washington still plays drums in various bands, but is best known for playing percussion with Bob Charlie and the Klukshu Flats Boogie Band.